When inquiring about our video transfer services, customers sometimes request to transfer their videos to VHS format. Ted's Video Services will gladly oblige, but here are some reasons why you would want to reconsider preserving your precious memories onto VHS video tapes. VHS is an analog video format, and an analog-to-analog video transfer will always result in a slight loss of picture quality. As with any technology that uses magnetic tape, video tapes are prone to wear and tear, and they can deteriorate over time, even in storage. Magnetic tapes can be affected by strong magnetic fields, possibly resulting in erasures. Damaged or "eaten" video tapes cannot be recovered. VHS, which was developed by JVC, has served consumers well for over two decades, but it is an obsolete format now. In fact, VHS VCRs are pretty much nonexistent at retailers, and when you do see them, they're in combo decks, like DVD/VCR. In summary, to preserve your videos and film, it is best to transfer your videos onto some digital format, like DVD or to a hard drive. 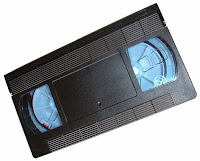 Note that converting your old analog videos, like VHS or Video 8/Hi-8 (8mm video), to DVD will not improve the picture quality from the original source, but you don't lose picture quality like you would in an analog video transfer, as in VHS to VHS.